C.F. 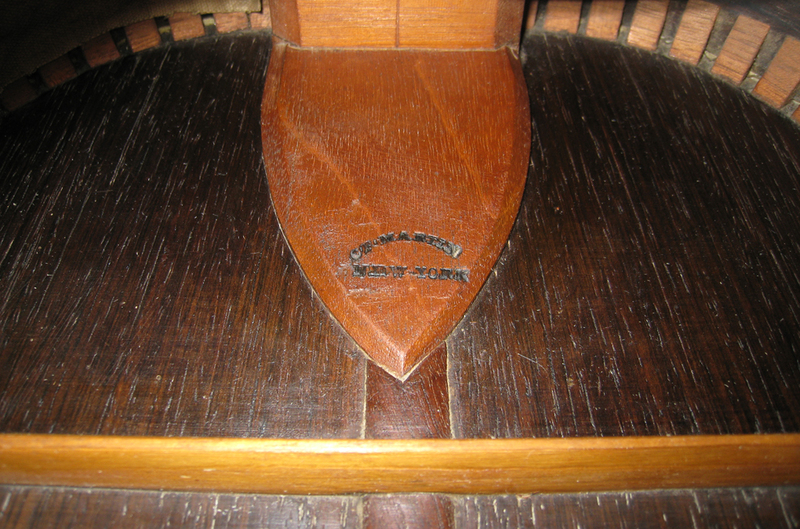 Martin generally stamped their flat top guitars in three places, on the neck block, on the inside of the back of the guitar, usually on the center strip, and on the back of the headstock of guitars with cedar or mahogany necks, or on the back of the guitar near the neck block on guitars with ebonized necks and a number of early cedar neck guitars. 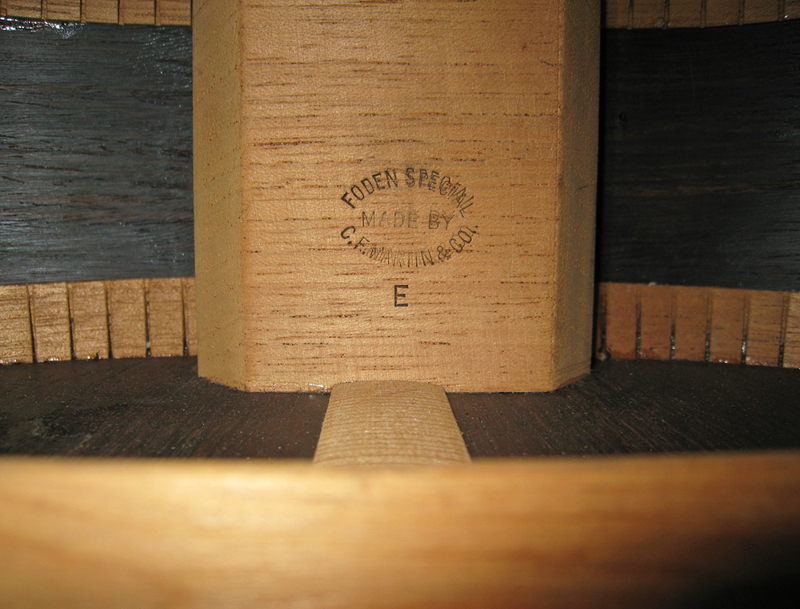 Early Martin guitars are stamped "C.F. Martin, New York" in all three places. 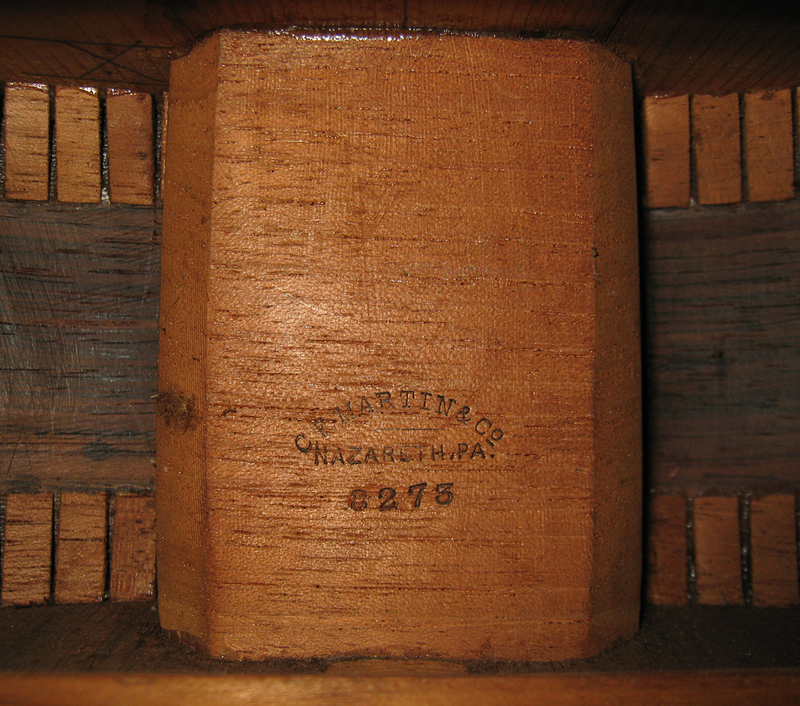 Beginning in 1867, the year Martin took on partners and incorporated, the headstock stamp remained the same, but the inside center strip stamp read "C.F. Martin & Co., New York", and neck block stamp followed shortly thereafter. Even after Martin moved to his new home in Cherry Hill, near Nazareth, Pennsylvania, his guitars were sold through a representative in New York, so the New York stamp remained. 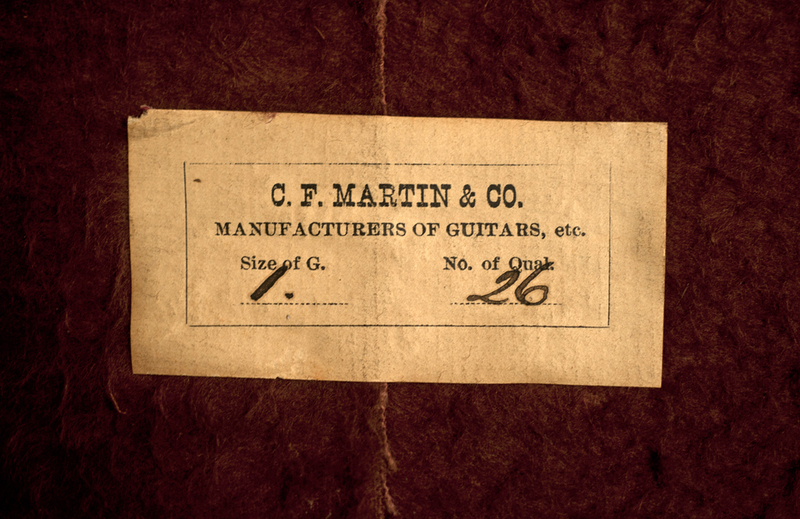 In 1898, after this sales arrangement dissolved, the Martin company began stamping their guitars "C.F. 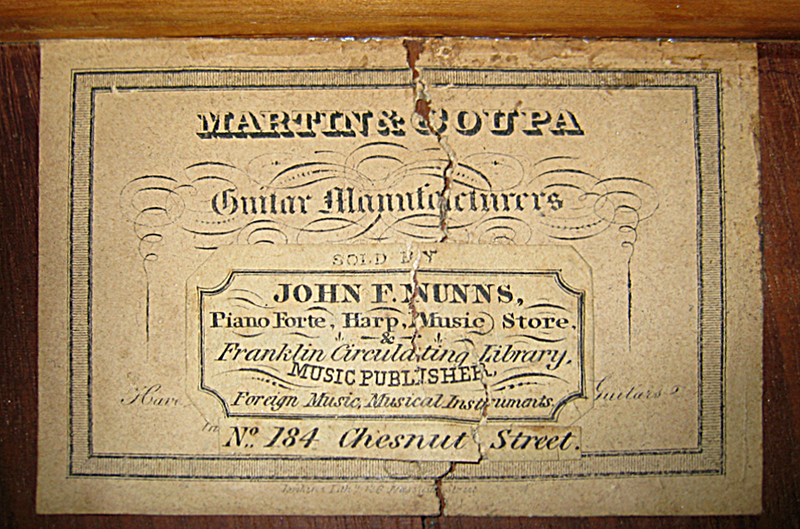 Martin, Nazareth, PA."
In 1898, Martin also began numbering their guitars, beginning with number 8000, an estimate of the number of instruments produced to that date, stamping the serial numbers on the neck block below the "C. F. Martin & Co." stamp. 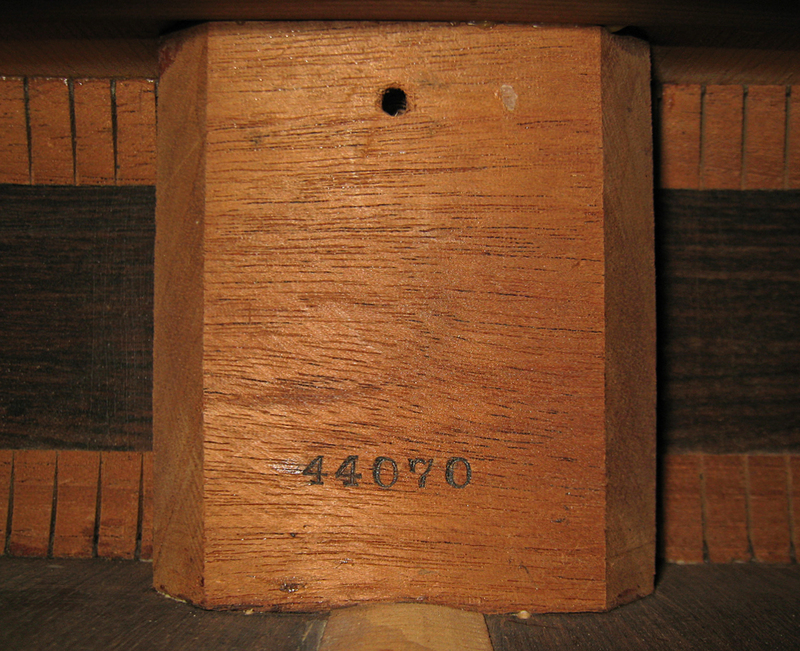 The earliest Martins have paper labels, sometimes accompanied by an outer back stamp as well. 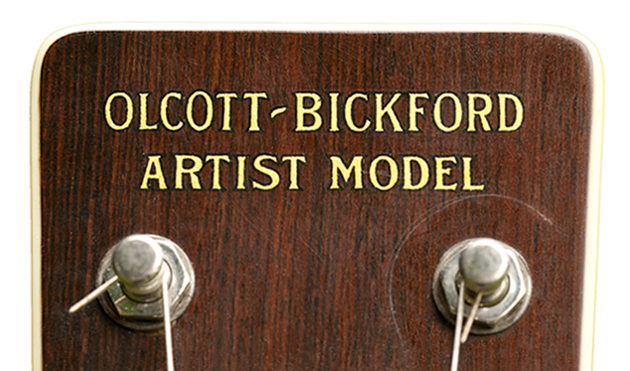 Martin also occasionally used paper labels on instruments built for dealers, or other special editions. 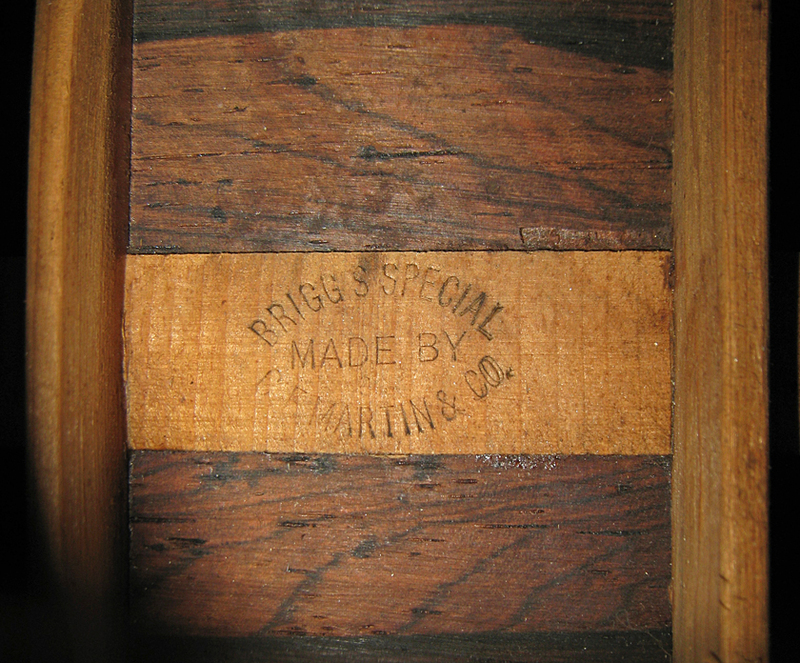 Finally, Martins supplied with coffin cases had a label glued to the inside of the top of the case which indicated the style and size of the guitar. Surprisingly, a fairly large percentage of the original cases have survived with the labels still glued to the cases over a century later. 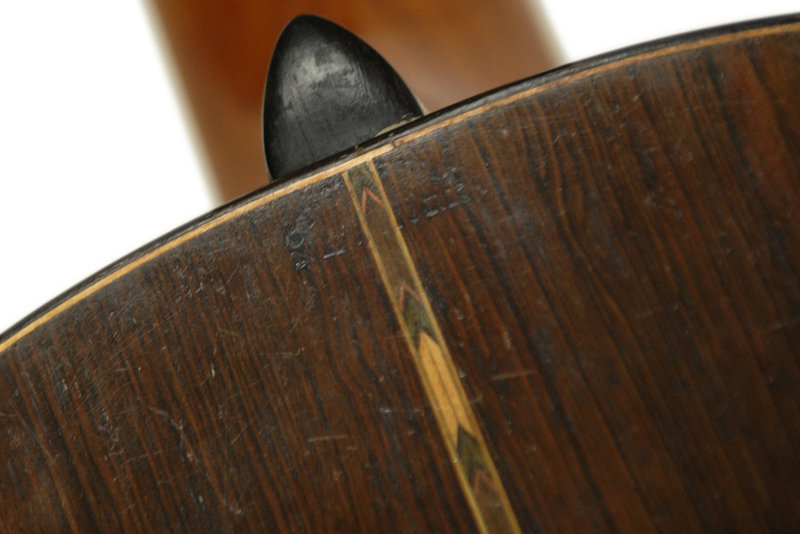 If the guitar were separated from the case, however, there would be no designation of the style number and size. 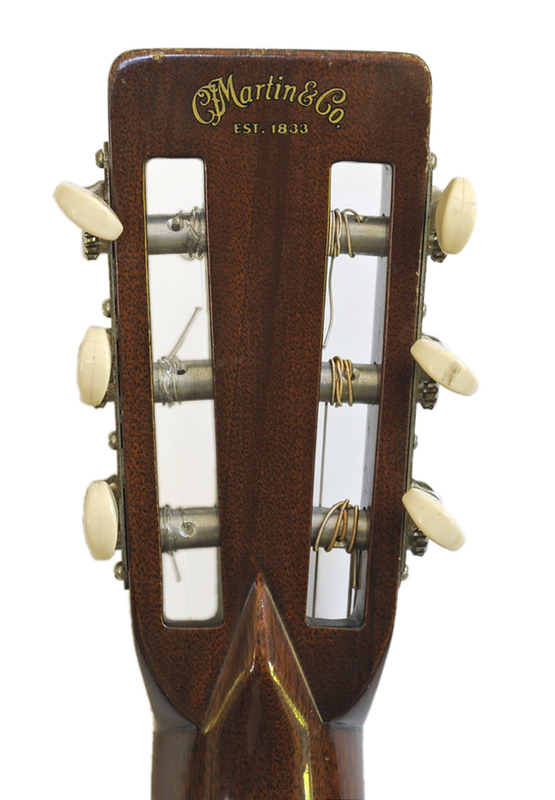 In 1934, Martin began stamping the style name and size on the neck block below the serial number. 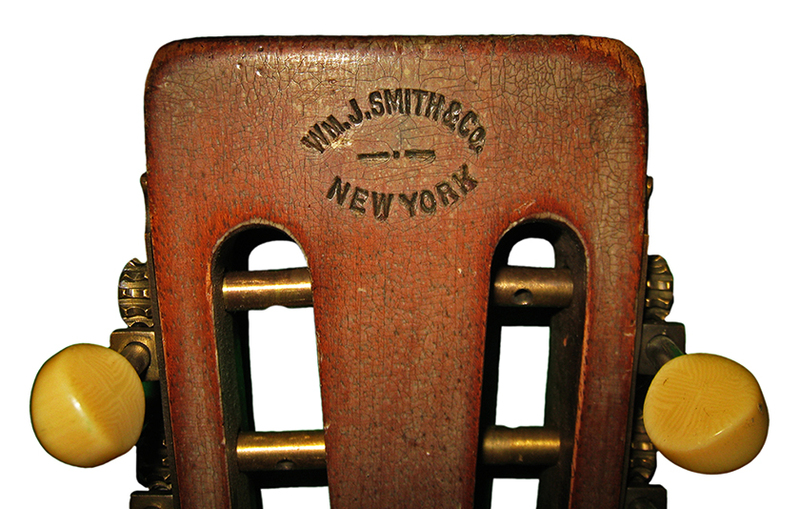 For a short time in 1900, Martin also stamped the serial numbers of some guitars on the end of the headstock. 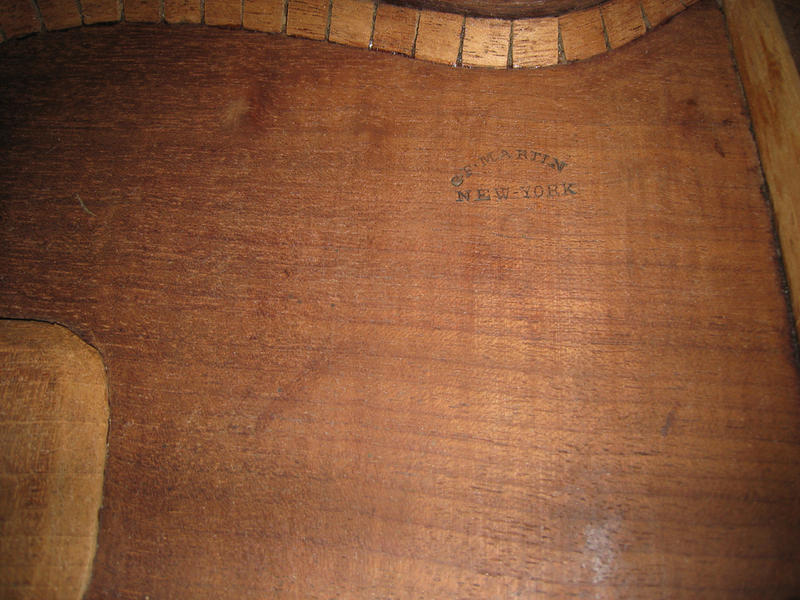 Several different labels appear on Martin Guitars with the 196 Hudson Street New York address. New York period. When the Martin family moved from New York to Pennsylvania, they sold inventory to Ludecus and Wolter for liquidation. 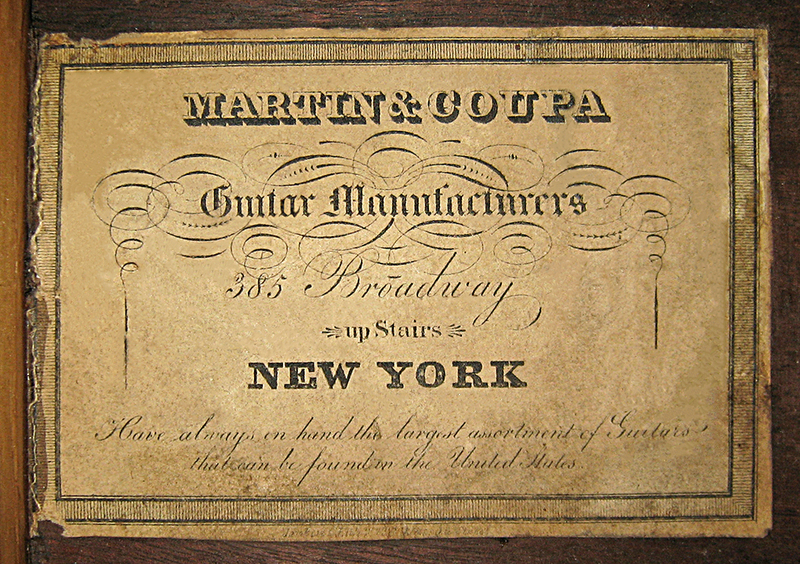 In the 1840's Martin teamed with John Coupa, who sold guitars with the "Martin & Coupa" label. 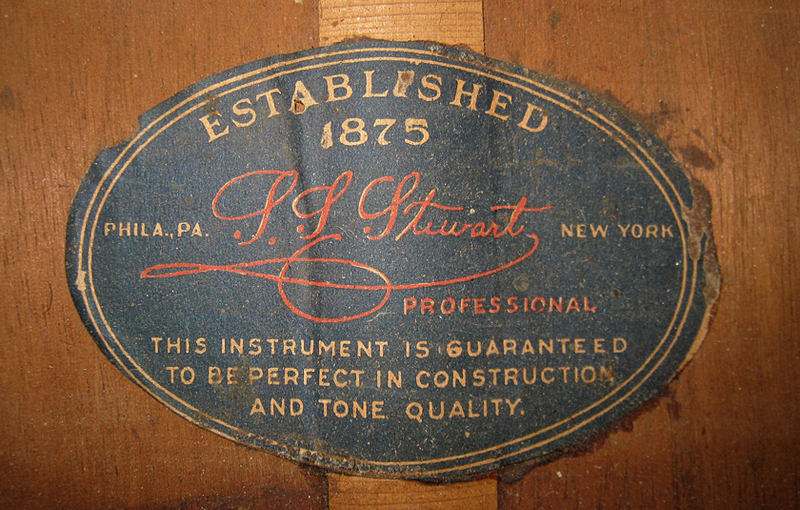 This label appeared in a small number of zithers built for P. H. Louis Brachet of Philadelphia in the 1880's. 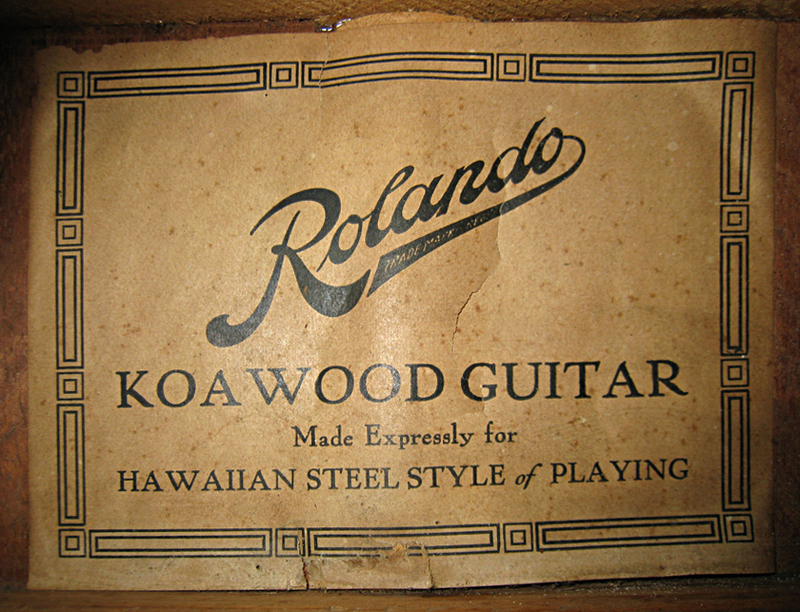 The "M. Nunes & Sons, Royal Hawaiian" label appears on some Hawaiian Guitars made for the Southern California Music Company to appeal to the Hawaiian market, while other SoCal models sport the "Rolando" label. 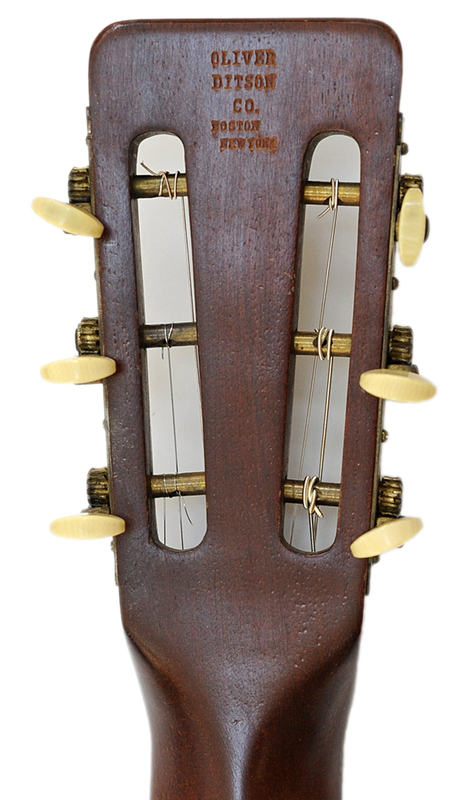 The Tiple is a ukulele size instrument with double strings that was developed for the Wm. Smith Company in New York in 1921. 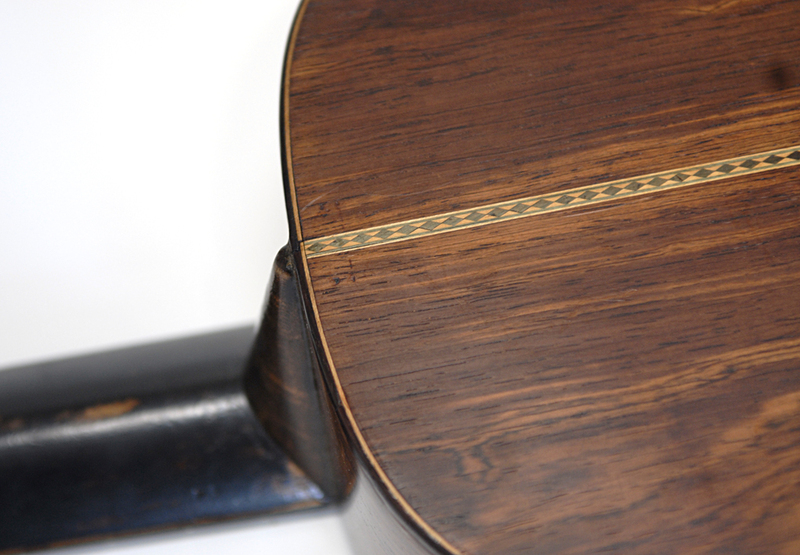 Most 19th Century Martin Guitars have "C.F. 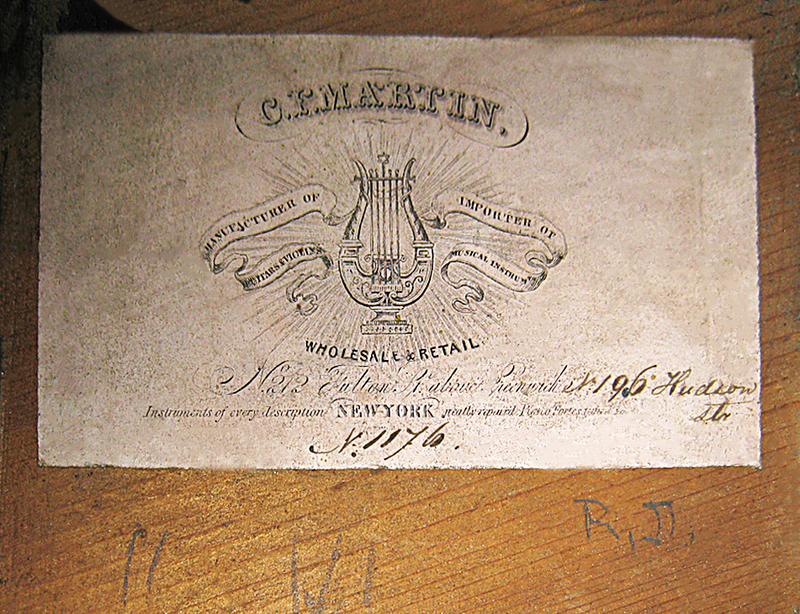 Martin New York" stamped on the back of their headstocks, as Martins were still distributed from New York even after Martin moved from New York to Pennsylvania. 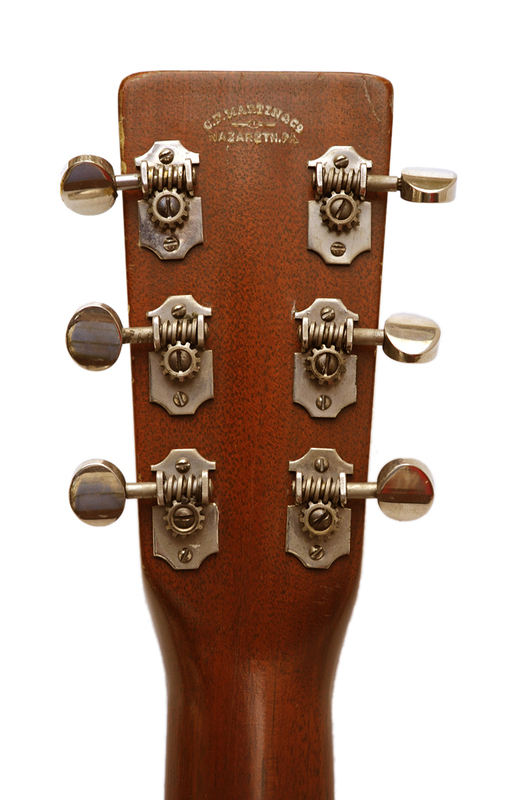 Numerous examples have been seen with holes drilled in the headstock, which were thought to be the result of unsophisticated owners who had clumsily defaced these beautiful guitars. 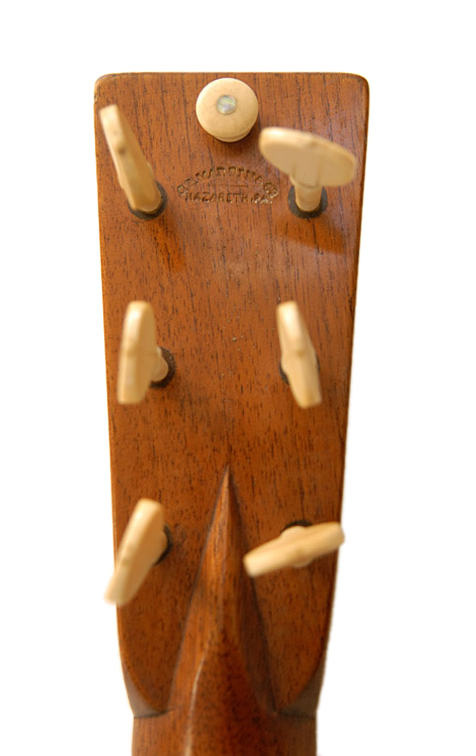 In fact, these holes were drilled in the headstocks of early Martins by Mr. Martin himself, for ribbons attached for hanging, following the tradition of the Spanish headstocks these emulated. 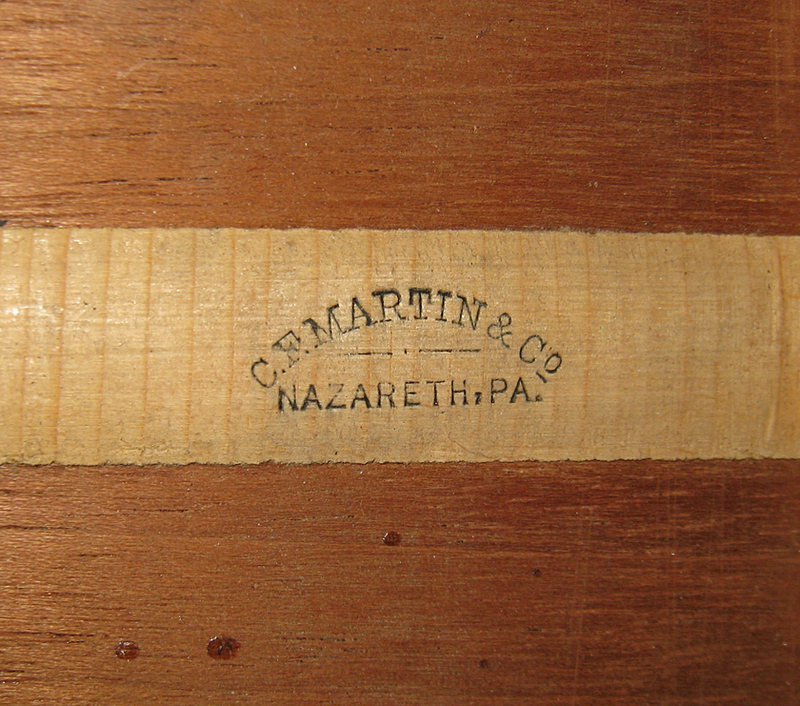 Once Martin began distributing their guitars directly from Nazareth in 1898, the stamp was changed to "C.F. Martin & Co, Nazareth, PA". 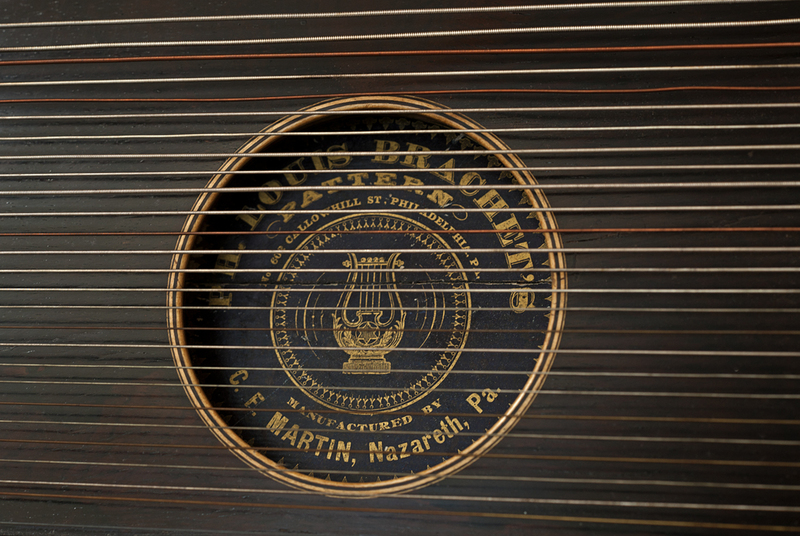 This 1896 Martin 0-42 has a "Nazareth, PA", which is unusual for a pre-1898 Martin. 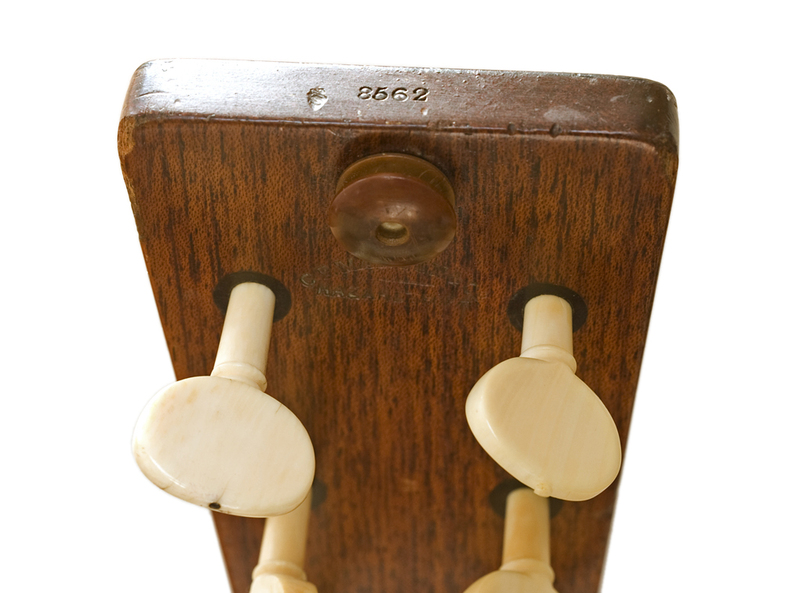 During much of the 19th century, Martins with tuning pegs also had a pegs made of ivory or horn on the back of the headstock for hanging. 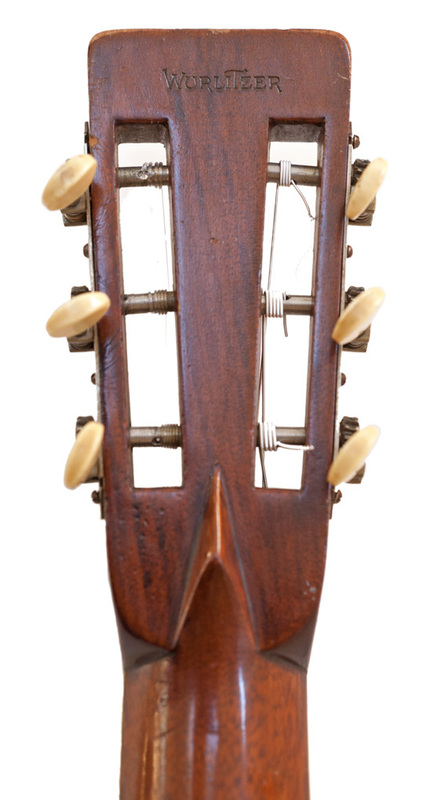 Early Martin guitars were made for classical playing and, traditionally, classical guitars were made with both headstocks and fretboards left unadorned and without inlay. 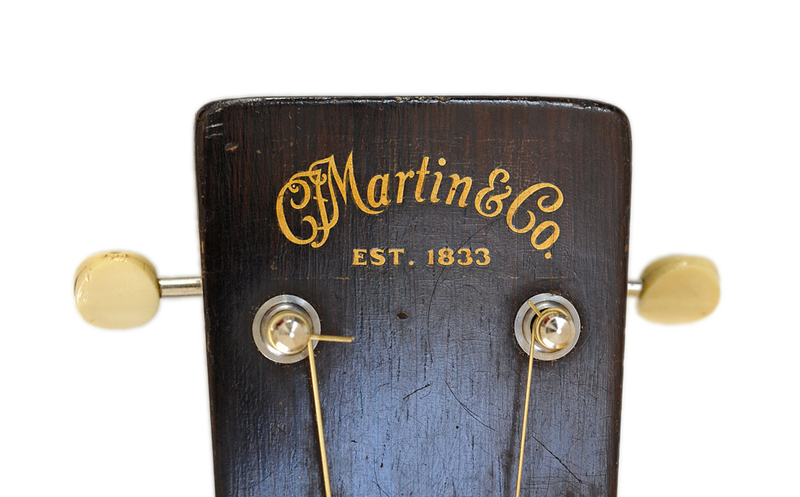 The first Martins with headstock decoration were 1860's and 1870's Martins with engraved silver plaques tacked to the headstocks, inscribed with the name of the owner. 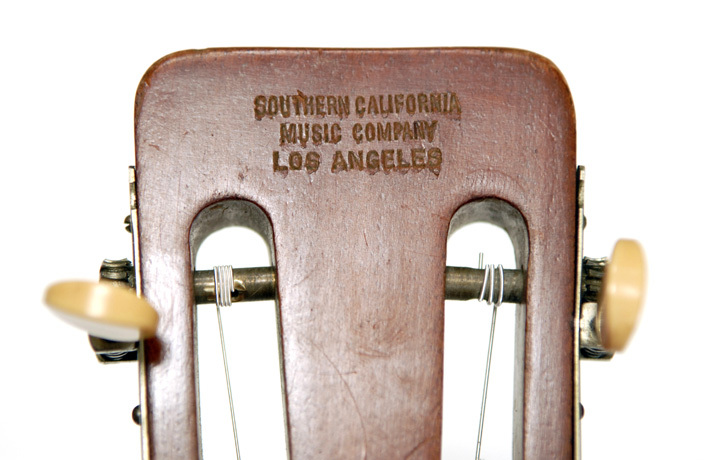 The first Martin logos appearing on the front of some Martin headstocks in 1932 were not decals, but were printed in gold leaf. These logos can be identified by letters lacking the black outline seen on the later decals. The solid gold leaf logo was replaced by a gold decal with a black outline. 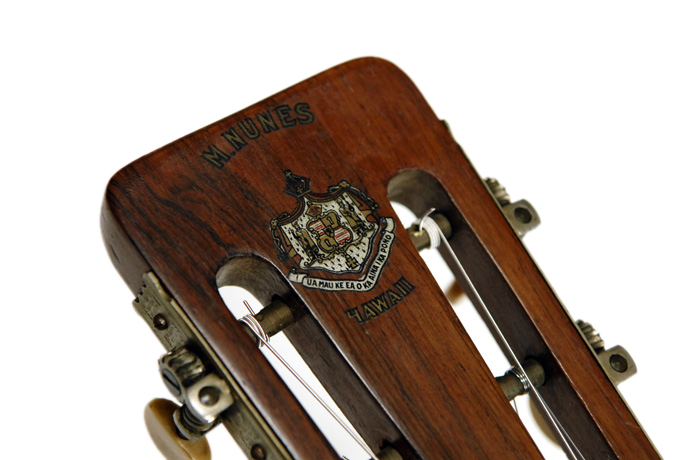 Until 1934, the front decal was used in conjunction with the stamped logo on the back of the headstock which was still used in this transitional period. According to the revised edition of Longworth, "the second version of the logo, with black edging, soon came in two sizes. 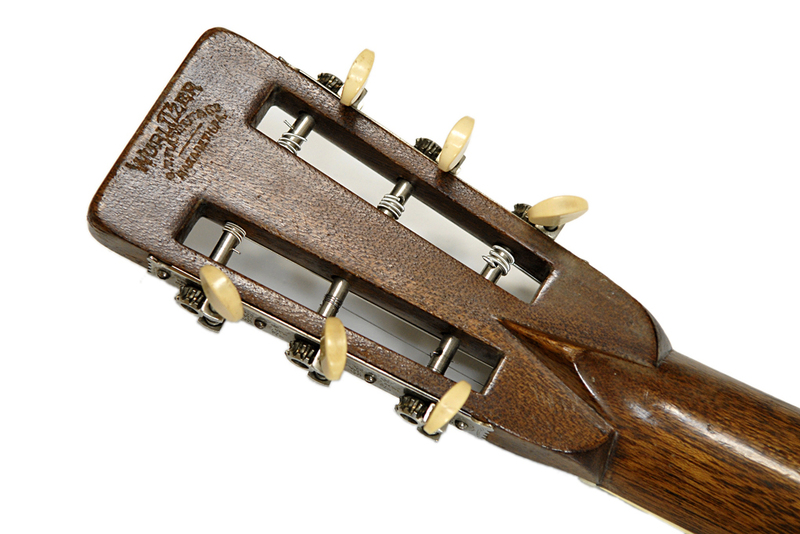 The large size was used on the solid headstock, while the smaller size was used on slotted headstocks, and also on mandolin and ukulele headstocks." 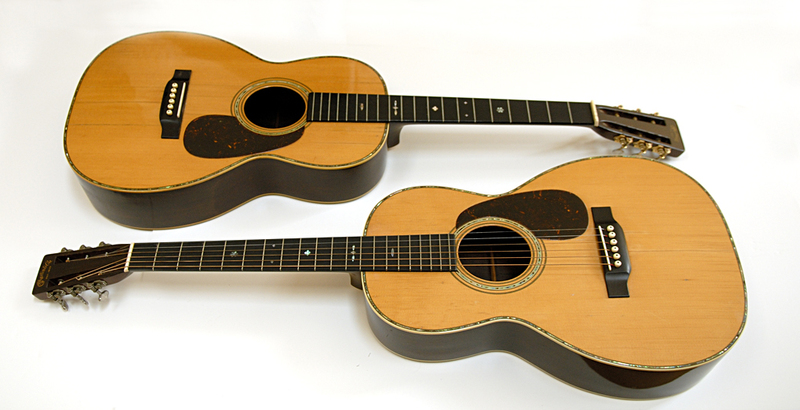 Here you can see two of the same model, both from 1934, presumably the year they changed, one with the larger, and one with the smaller logo. Here's the later, smaller logo on a 1962 000-28C. 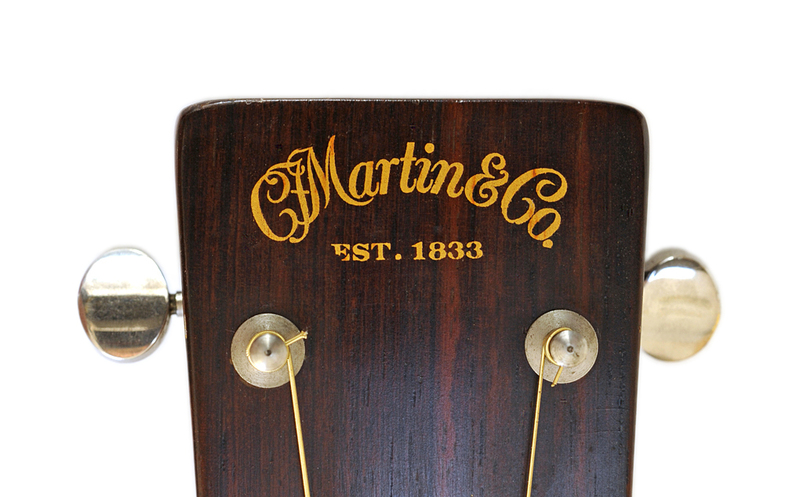 Note that on the "G" and "C" Model Martins, built for gut or nylon strings after the introduction of steels strings, Martin followed the tradition of leaving the head plates on classical guitars blank by placing the decal on the back side of the headstock. 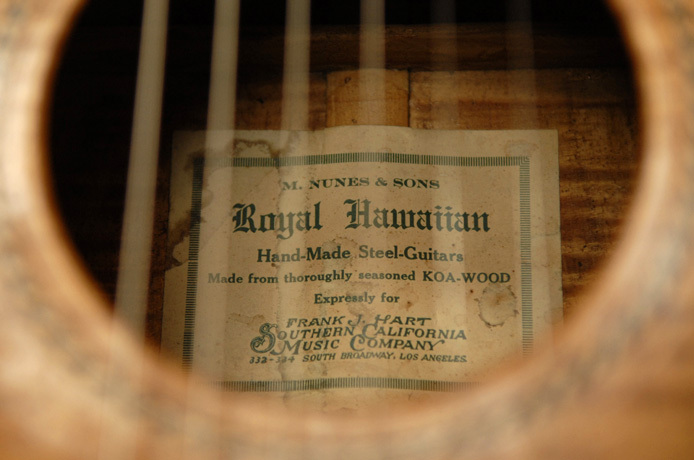 The Southern California Music Company requested that the Martin name not appear on their early Hawaiian guitars, preferring to use the name "Nunes", which was respected among Hawaiian players. 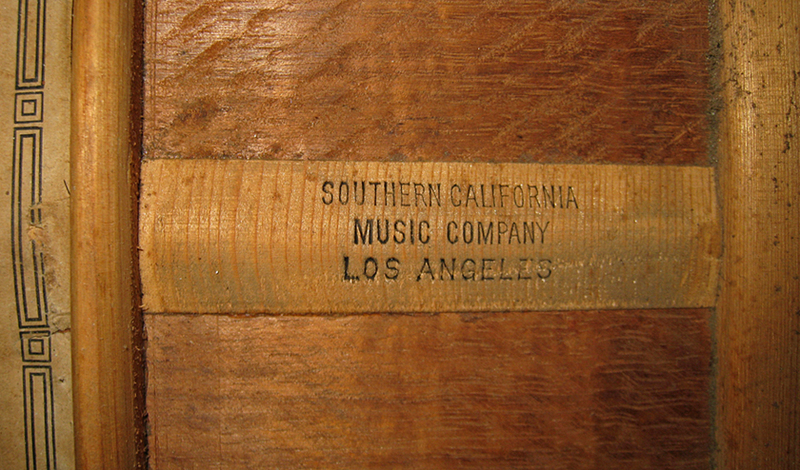 Over the years, some of their guitars had the SoCal name stamped on the back of the headstock, some had the Martin name, some both, and some none at all. 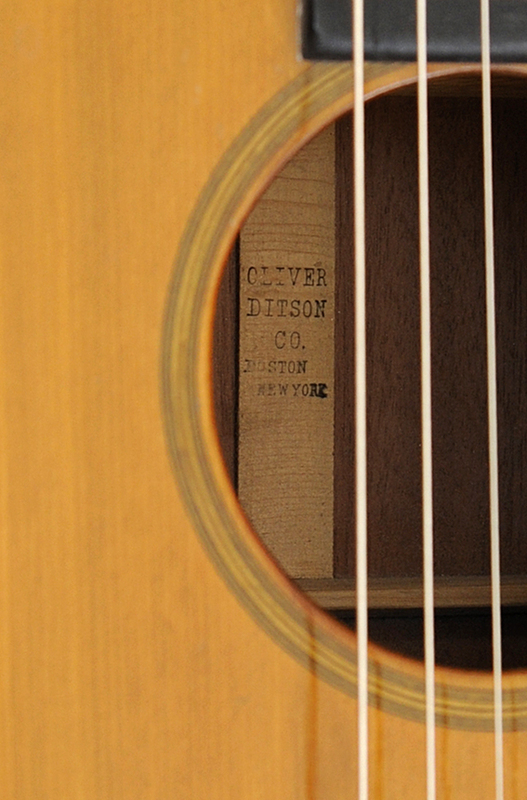 The Oliver Ditson Company had their name stamped on the back of headstocks. 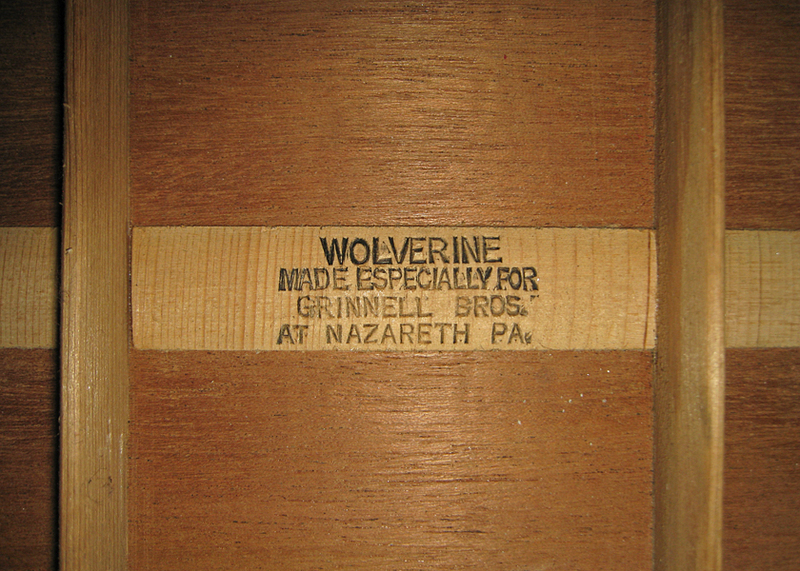 The Grinnell Store in Detroit, a major Martin dealer, chose the name "Wolverine" for their guitars. 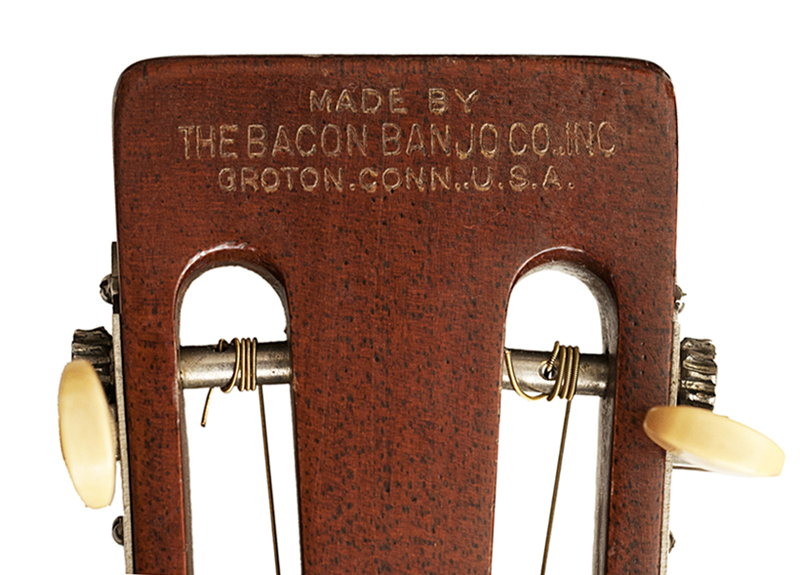 In 1923 Martin produced three Style 0-21 guitars and a few ukuleles for the Bacon Banjo Company in Groton, Connecticut. The first Tiples were developed for the Wm. Smith Store in New York. 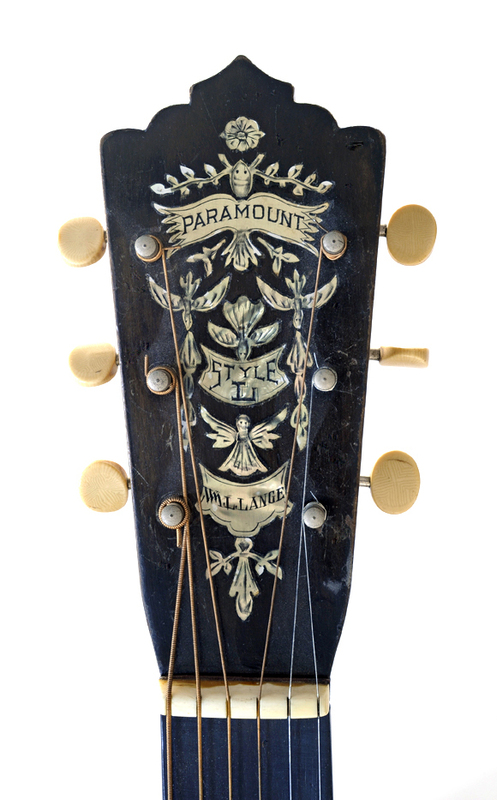 The "Paramount Style L" produced for the William L. Lange Company was not stamped as such, but the Paramount name appeared on a fancy inlaid headstock veneer supplied by the Lange Company. which appears to have been hand painted. 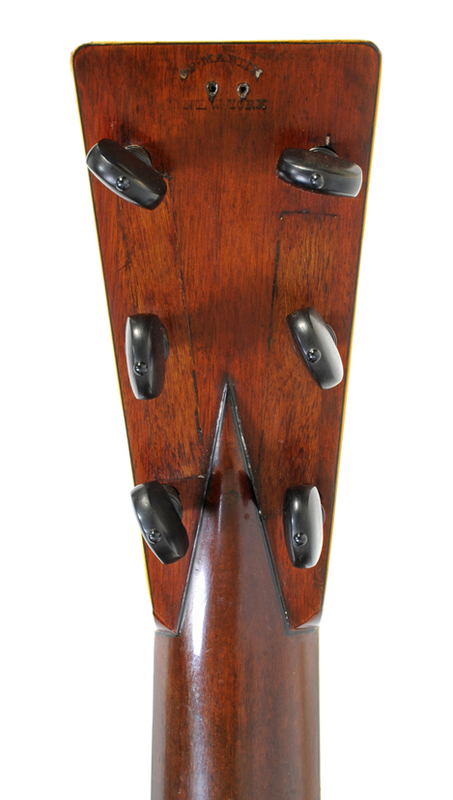 As you can see, the ebonized, Stauffer style headstocks of early Martins, dressed in black, did not provide an ideal surface for the Martin stamp. 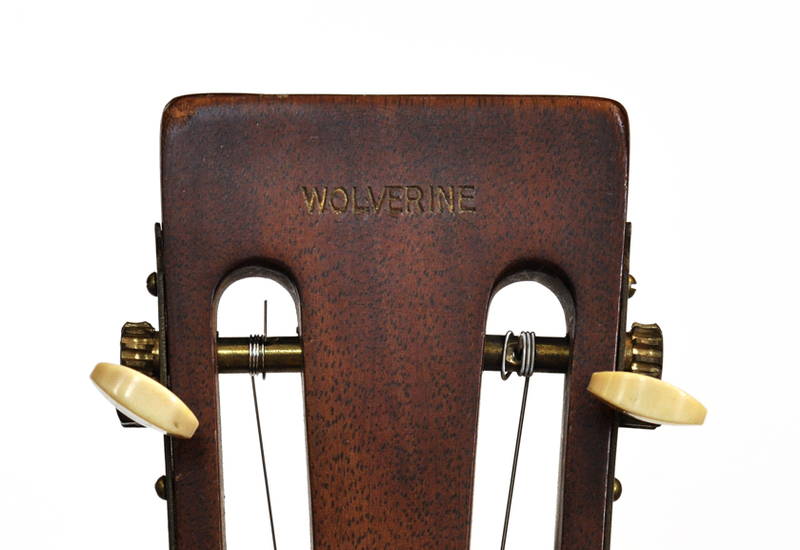 ...and into the beginning of the 20th century on guitars with the black ebonized headstocks and necks. 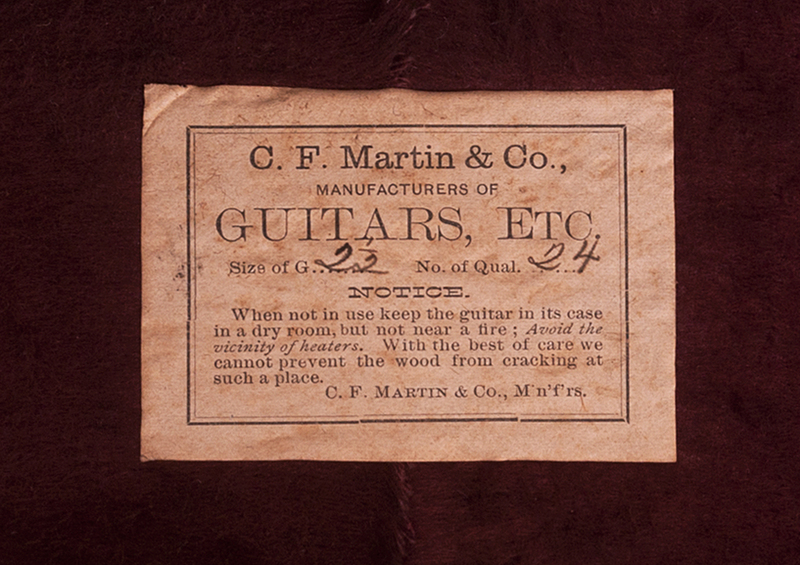 Martin's earliest guitars are stamped "C.F. Martin, New York" on the inside back center strip. Once C.F. 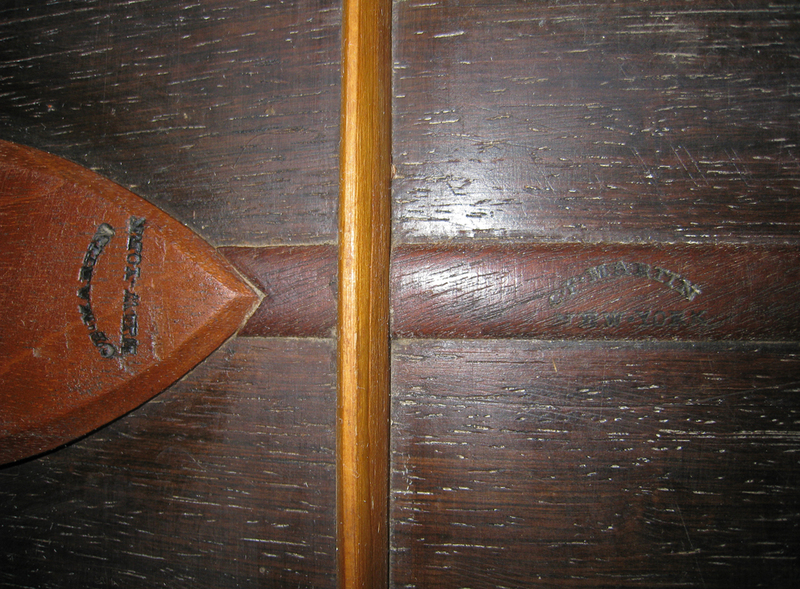 Martin Sr. took on his son and nephew as partners in 1867, the inside back center strip began to read "C.F. Martin & Co., New York". 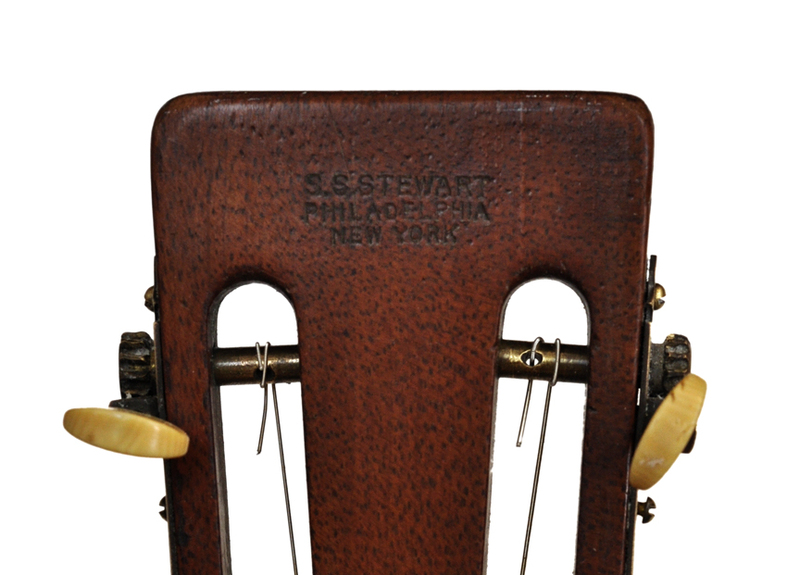 Martin continued using the New York stamp for many years after moving to Pennsylvania as his guitars were still distributed from New York. 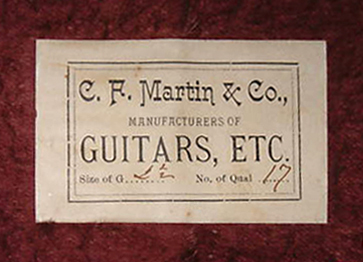 After Martin's distribution arrangement in New York ended in 1898, the inside stamp began to read "C. F. Martin & Co. Nazareth, PA"
Note that Martin headstocks continued to read "C.F. 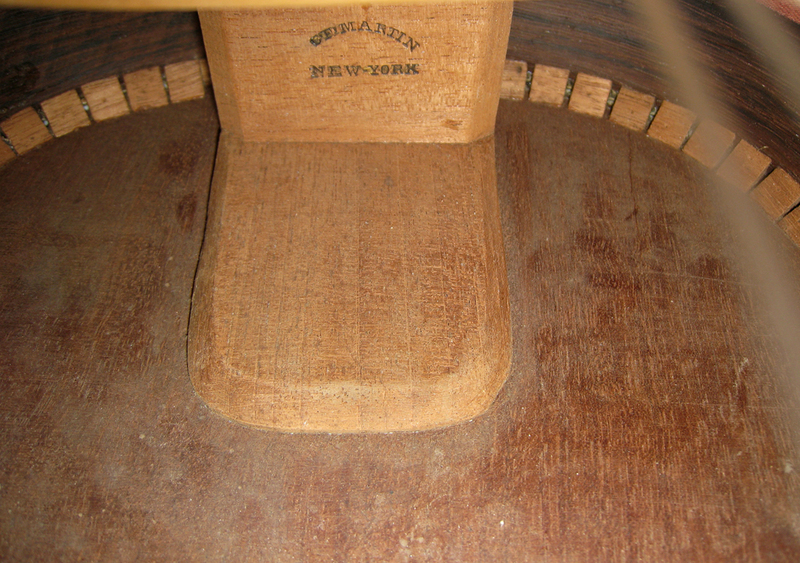 Martin New York" only until 1898, even after the interior labels added "& Co.". 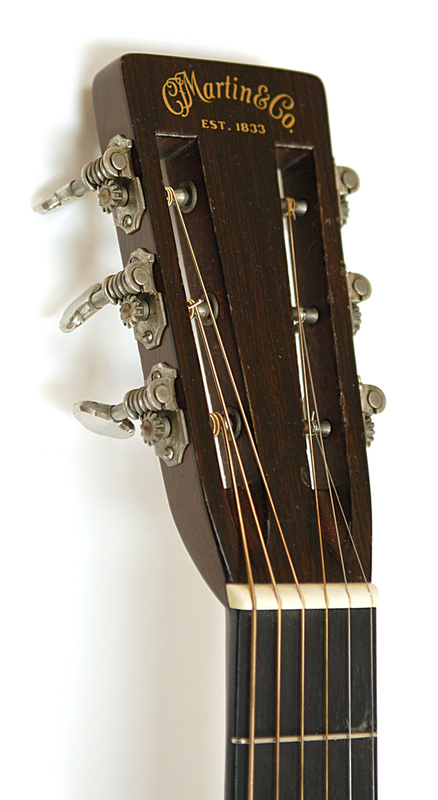 In other words, from 1867 until 1898, Martin headstocks read "C.F. 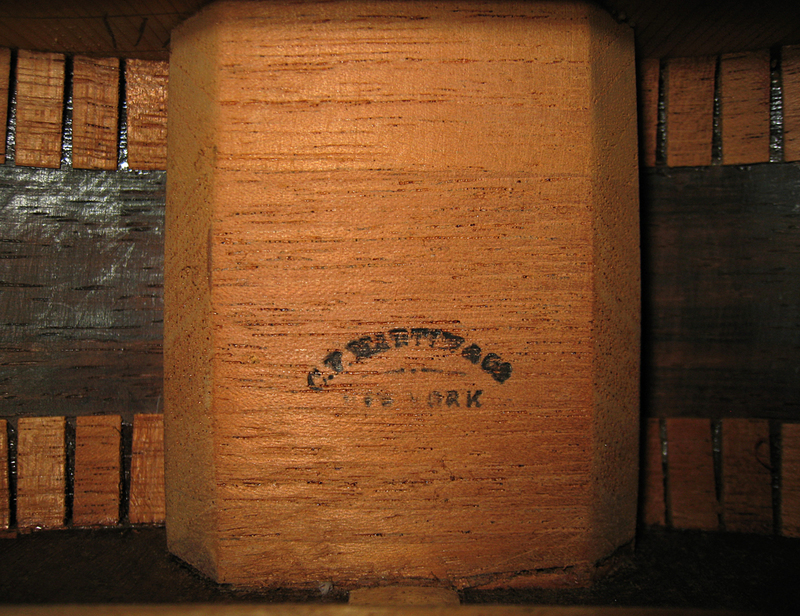 Martin New York", while the interior stamps read C.F.Martin & Co. New York". 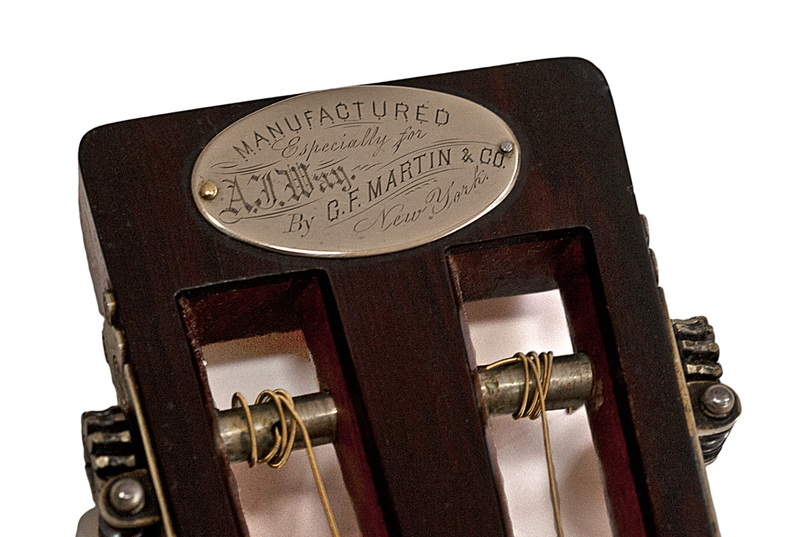 Many, but not all, of the guitars Martin made for other firms were stamped with the names of those firms. 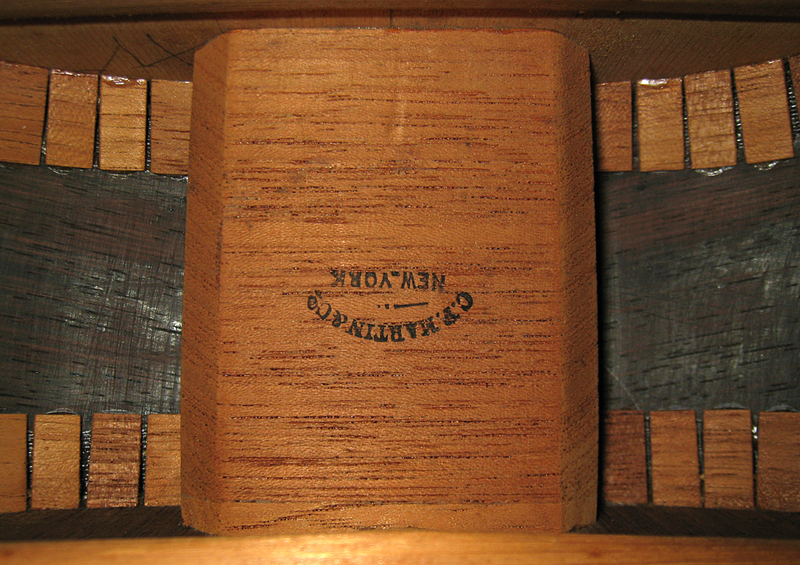 With the exception of a few early examples with the Spanish foot, such as the one above, all of the neck block stamps I've seen on Martins from the very earliest to this example built in March, 1889 are upside down. All of the later neck block stamps read right side up. 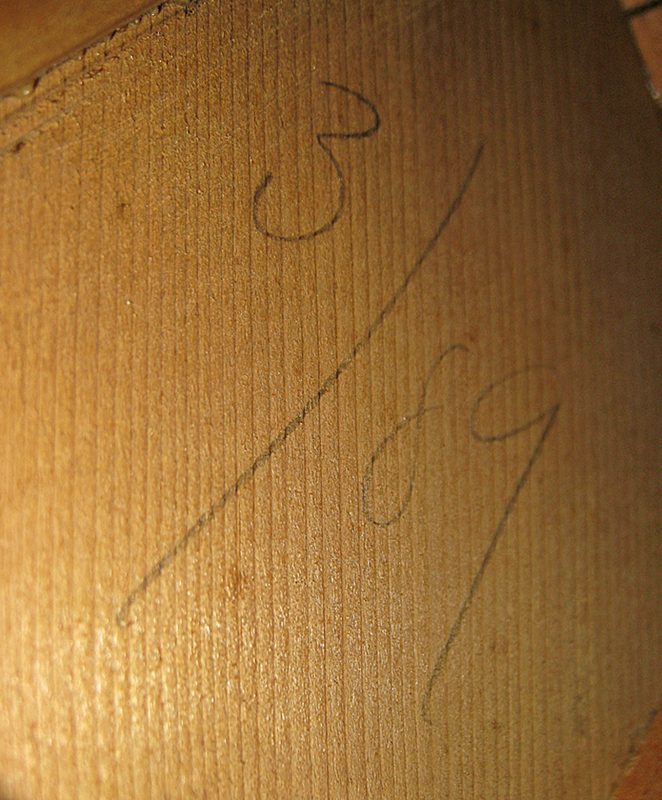 The earliest example I've seen was stamped "2/90". This narrows the date of change from sometime between March, 1889 and February, 1890. 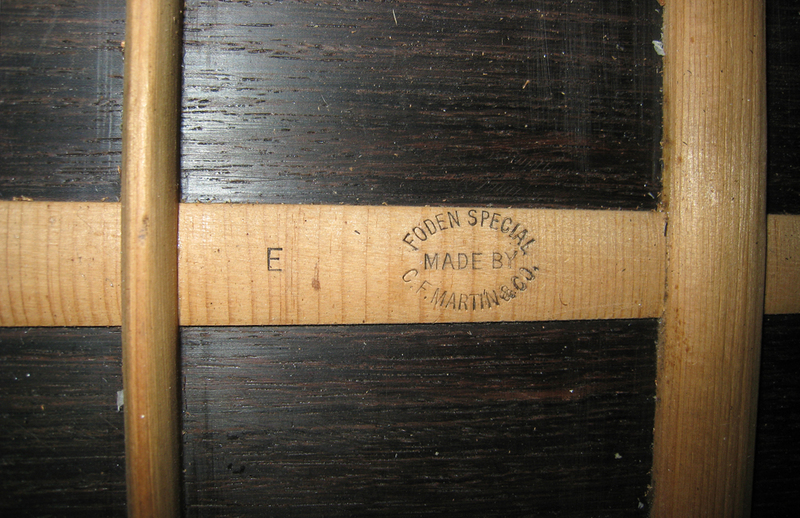 The Foden Special is one of the few Martins with a unique neck block stamp made for a specific dealer. 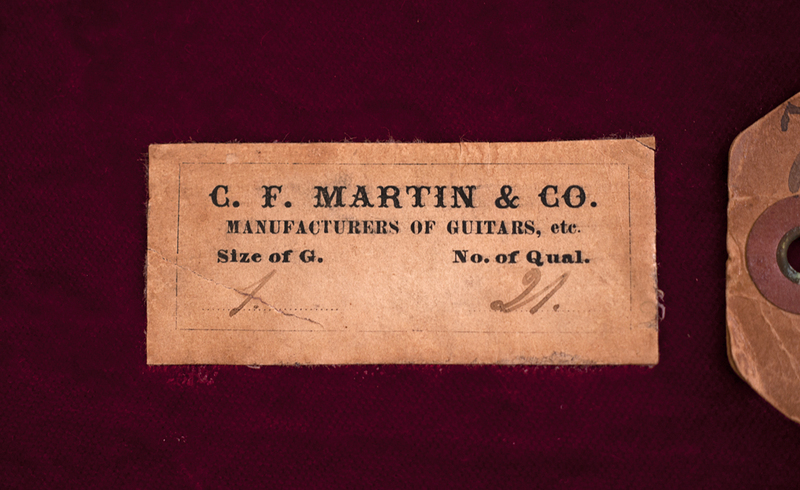 In 1898 Martin began assigning serial numbers to their guitars, starting with the number 8000, estimating the number of guitars produced to date. 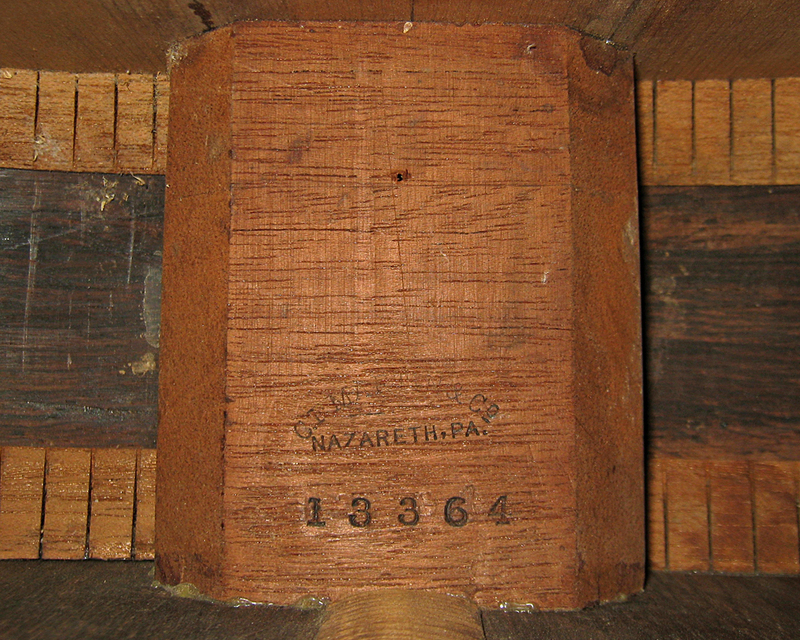 Serial numbers, along with the new Nazareth, PA stamp, were imprinted on the neck block. 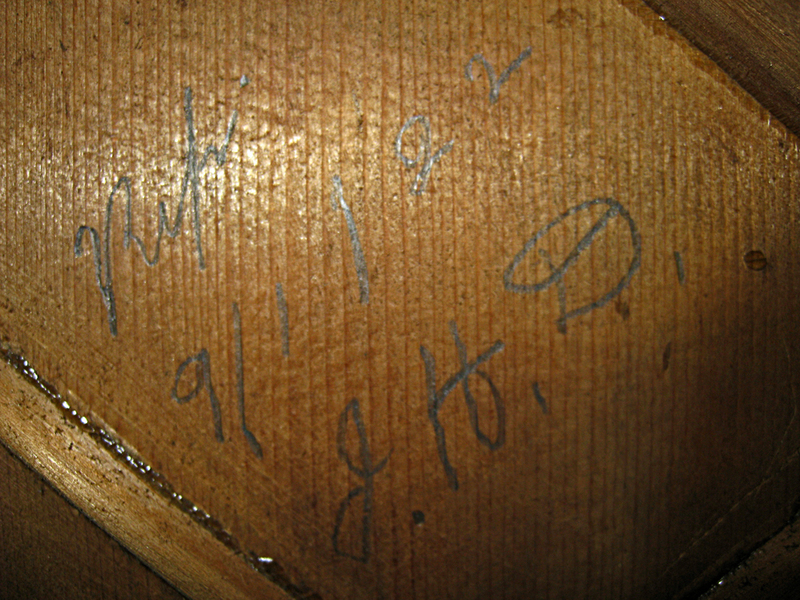 In 1918, Martin was still stamping the Nazareth Address on the neck blocks. 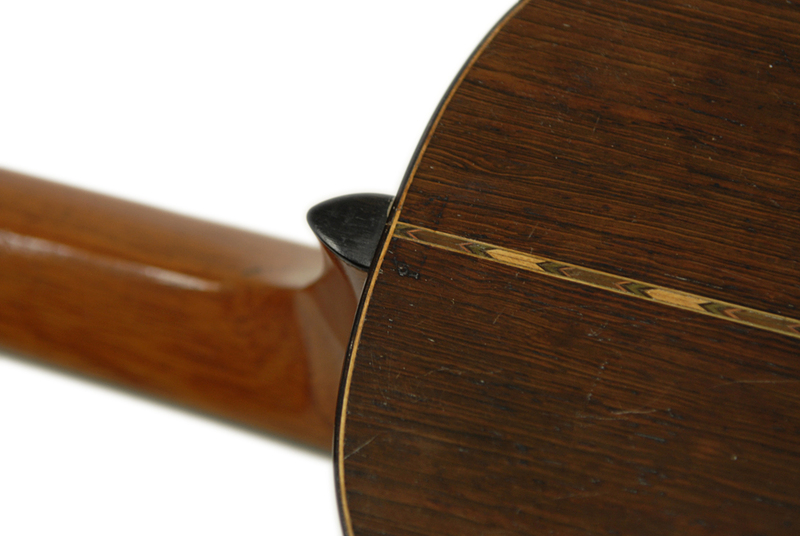 By 1919, when the company was struggling to keep up with production, Martin began stamping the serial number only. 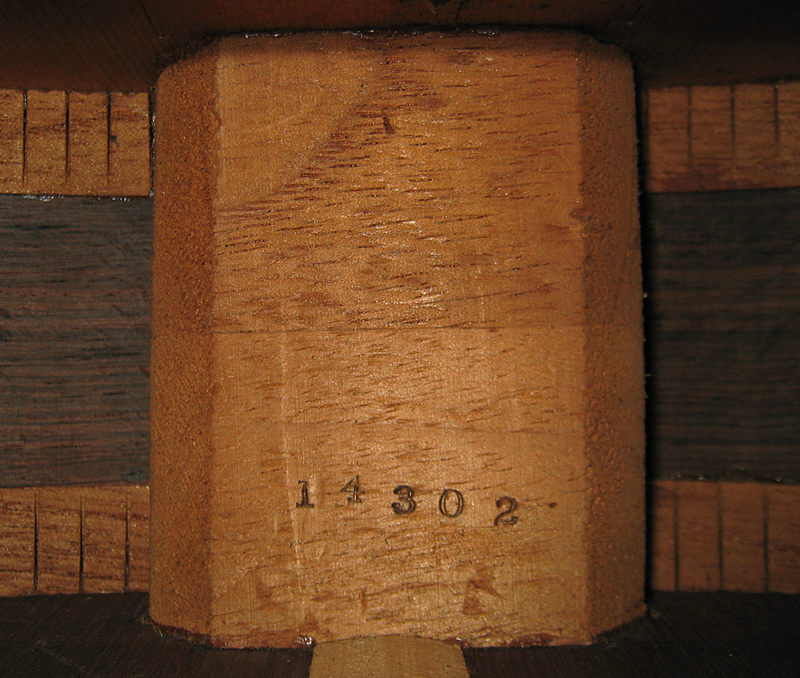 Beginning in 1930, Martin also stamped the model number on the neck block. 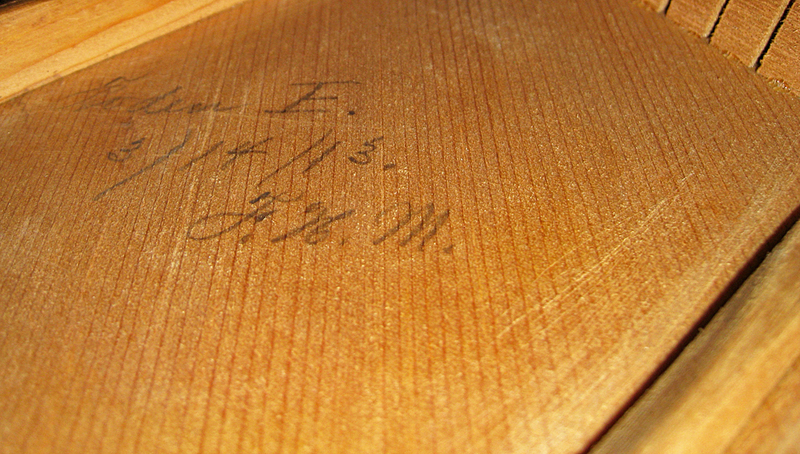 Apparently, Martin began stamping the Model name on the neck block near the beginning of October, 1930. 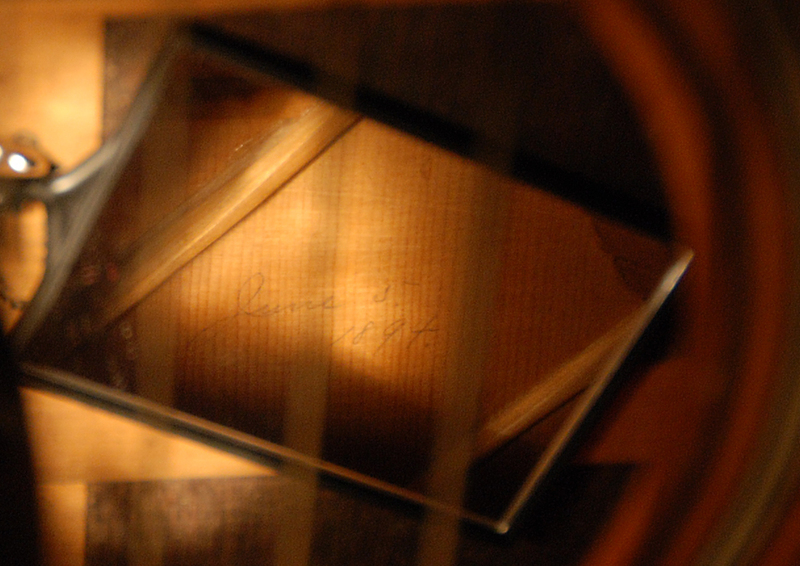 Many, but not all, Martin guitars built between the 1870's and the second decade of the 20th century are dated in pencil on the underside of the top. The format varies greatly, with some initialed by F.H. Martin or a shop foreman, some containing the day and month, and some showing the year only. 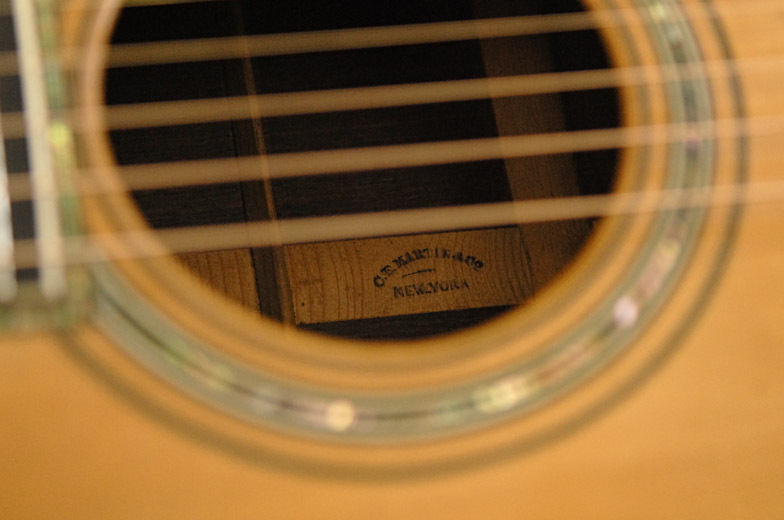 The guitar below is a rare example of an instrument with a repair that was documented, in this case by shop foreman John Deichmann, the creator of the Dreadnaught, the Orchestra Model, and a number of Martin's other greatest achievements. Martin used a number of various labels in their cases, with minor differences in typefaces and design. 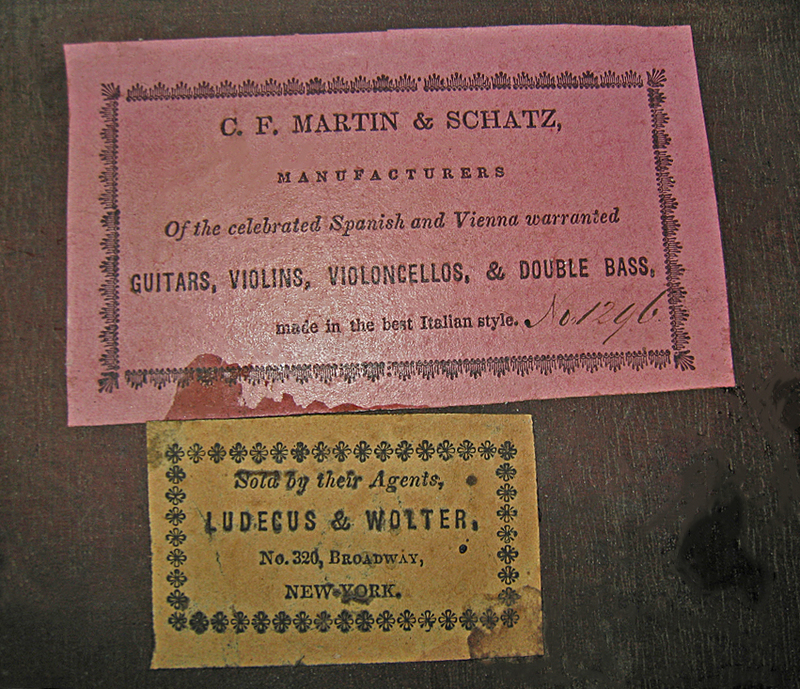 This is the very first Martin label to appear, showing up in 1867, the year Martin incorporated. 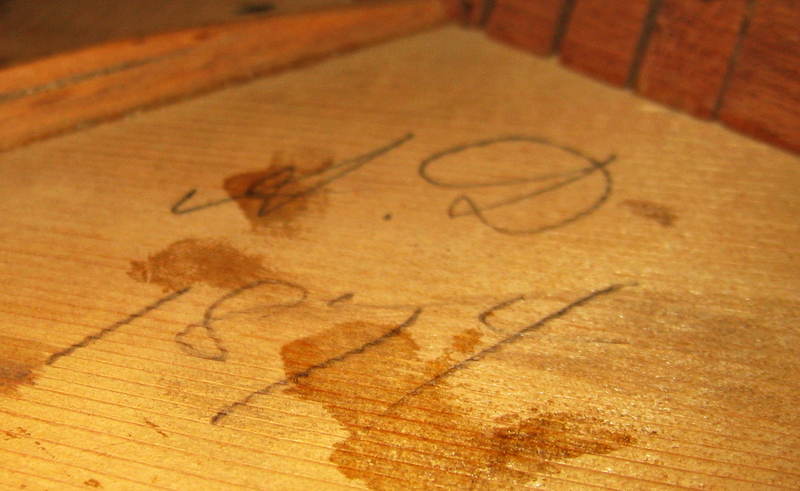 No labels were made for Martins in coffin cases before incorporation was signified with "& Co." affixed to the Martin name. The earliest labels appear to be cut by hand with irregular edges and borders, and measure roughly 1 5/16" x 1 5/8". 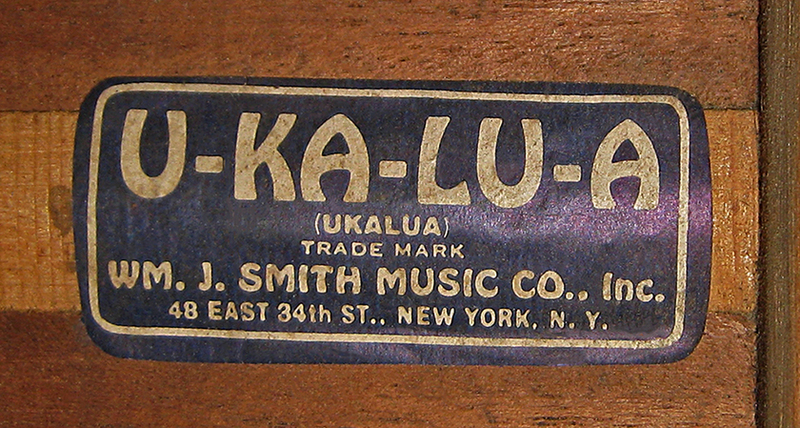 This similar looking label appears in the 1870s, with the same information, but a simpler typeface, with bold horizontal serifs and lacking the fancy ornamentation in the mid line of the letters, and using a noticeably less bold type style for the "size" and "quality". 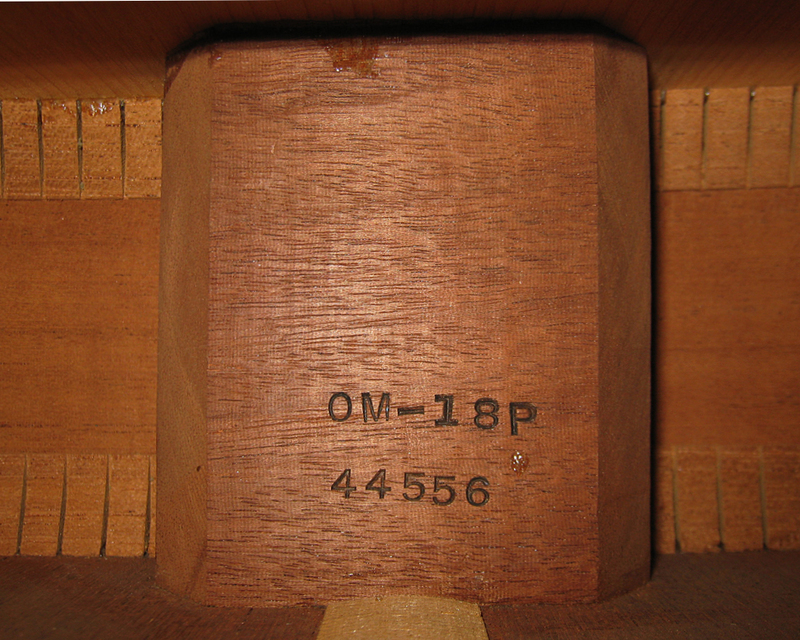 The larger Martin labels measure roughly 2" x 2 3/4". This style, with care instructions, appears in the late 1880's. 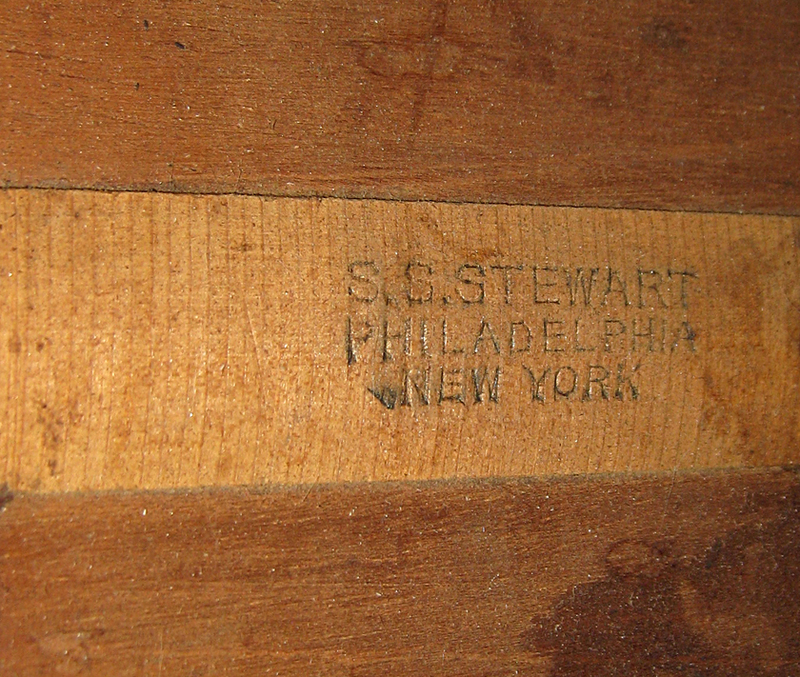 This label was common in the 1890's. 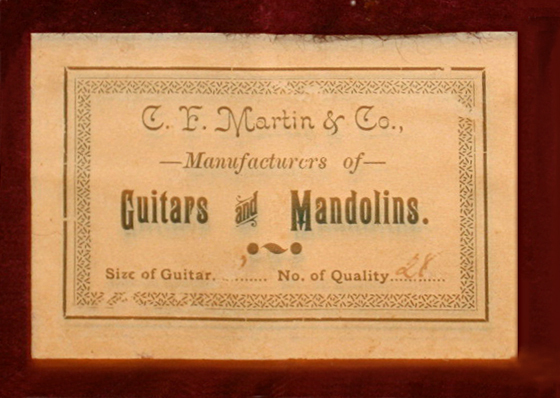 This last label, for Martin "Guitars and Mandolins", must have been the last Martin label to appear, as Martin only began to sell mandolins in 1895. 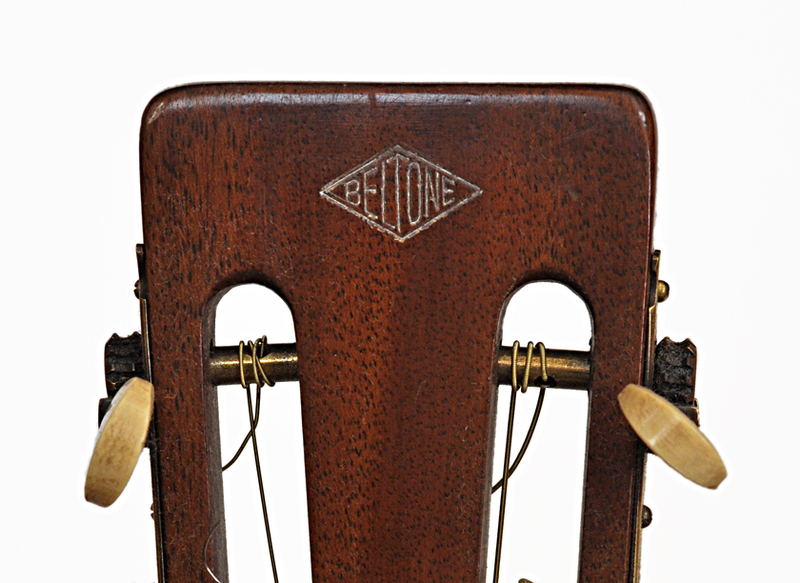 By 1899, Martin was selling two thirds as many mandolins as guitars, so it is understandable that Martin would begin to give mandolins equal billing on their labels. entire site copyright ©1998 through 2018 Robert Corwin/Photo-Arts. All rights reserved.